NICKY, in David Herman's book, "Hill Walkers Donegal", a circular walk beginning at Lough Barra is given. It is: 'Route 11 - Slieve Snaght from the south'. It begins from the carpark at B 929124, goes to the waterfall directly south of S. Snaght, then climbs over boulders to the top of the mountain. After that it descends the NE spur to the northern end of Lough Slievesnaght, climbs again due E to cross the ridge, with Drumnaliffernn to the left, and then heads SE along a soggy valley back to the starting point. All in all, it is given as a 9km walk and a 640m climb, though Herman's estimations tend to be tight. An A to B variation is also given, if a second car can be arranged, but this too loops around to the south. If you intend reaching Errigal, I know from experience that there are two possibilities. The first is the easy one. When you reach the northern end of Lough Slievesnaght, descend the gully directly north, which takes you down by the eastern shore of L. Maam. From there a northerly course over undulating ground takes you to the entry to the Poisoned Glen and Dunlewey, looking directly across at Errigal. The more challenging route would be to continue on eastwards from the northern end of L. Slievenaght, over the ridge and across what is called the Rocky Cap to the head of the Poisoned Glen. The descent is made here and brings you back to Dunlewey. All of this is described (although with no great detail) in Herman's Route 10: 'Slieve Snaght and the Poisoned Glen'. I have walked this route and found it thoroughly enjoyable, although I took it in clockwise direction. 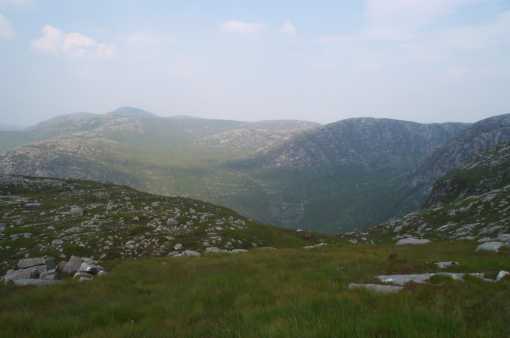 The photo was taken above the headwall at the top of the Poisoned Glen and is looking SW, over the rounded tops on the Derryveagh plateau, to Slieve Snaght, whose dome can be seen on the horizon, to the left. The day I crossed it, the sun had been baking the rocky slabs the whole morning and I could even feel the heat coming up through my vibram soles!